As I sheltered under a shop awning, watching the hail bouncing off the pavements on an English ‘summer’ morning, my mind turned to sunny holidays and then narrowed it down to holidays that aren’t too far away, what with having to listen to small people asking ‘Are we there yet?’ for the entire journey. So, when I finally emerged back into the soggy street, I had decided upon France for my holidays and French cheese for this week’s fromage. 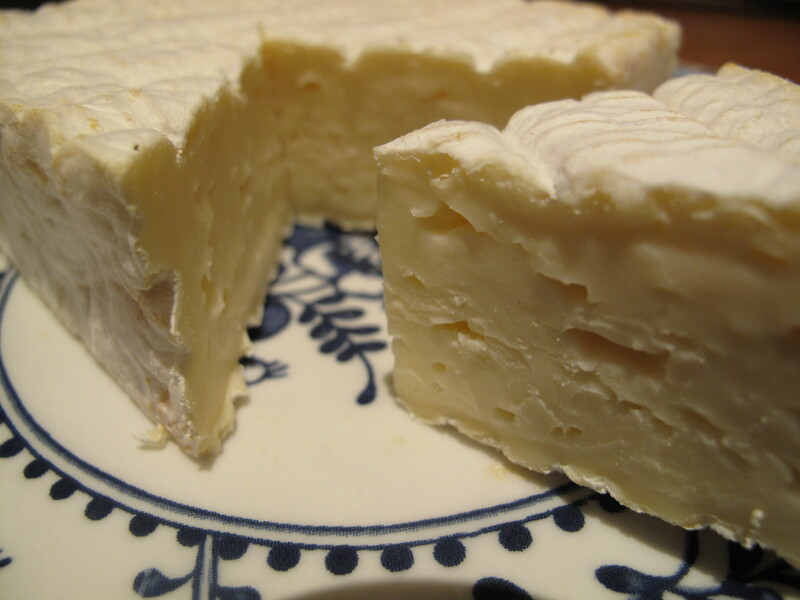 Pont L’Évêque is a soft cheese made from raw cow’s milk. Here is it, a fine-looking cheese that can even stand up to my attempts at food photography. Dating back to at least the twelfth century, Pont L’Évêque is believed to be the first cheese made in Normandy and the oldest Norman cheese still in production today. The medieval version of the cheese was made by Cistercian monks and called Angelot, also the name of a coin, as the cheese was used to pay taxes and wages (oh my word, can you imagine being paid in cheese?!) The name Pont L’Évêque was later adopted and derives from a small town in the Calvados department, which is also famous for its brandy (so an all-round hot contender for my forthcoming holiday, I would think). The cheese’s characteristic square shape developed to differentiate it from Livarot, a local rival. The rind has a criss-cross pattern from the straw mats on which it is ripened and is a yellow-brown colour as a result of being rind-washed in brine. As I learned from last week’s encounter with Burwash Rose, rind-washing also gives cheese a pungent smell, although my Pont L’Évêque was fairly civilized in this regard. The cheese inside the edible rind (called the paste or pate, as I now know) is soft without being overly-gooey and has small holes in it. Cheese connoisseurs describe its smell as reminiscent of everything from bacon to hazelnuts and its taste as like cooked cauliflower or cookies. It smelt like a barn to me, of straw tinged with something a bit more, ahem, earthy. The texture was firm but creamy and slightly sour with a bit of a mushroomy taste. If you like a Brie or Camembert then this is a cheese for you. And a new addition to my fromage knowledge: AOC status. Pont L’Évêque was granted AOC status in 1976. AOC is an acronym for ‘Appellation d’Origine Contrôlée’ which translates as ‘controlled designation of origin’ and can be awarded to French products such as cheese, wine and oils. The label tries to protect products which have a long history and are produced in a specific area so that the brand cannot be replicated and diluted across global markets. Only 46 French cheeses have so far been awarded AOC status. Haha, thought you’d like it after yesterday’s comments. Of all the cheeses in all the countries…Must check out Livarot too. Fromage Friday! That is an amazing idea! Do you know what AOC is called in English? The foreign words always sound nicer, and I end up saying “that thing where you can’t make it unless you do it in the right place in the right way, well you CAN make it but you can’t call it that, if you know what I mean”. Thanks you! I would just call it AOC! There is a European Union equivalent called PDO (protected designation of origin) that covers some British products like Stilton but that doesn’t exactly flow off the tongue either, does it?! 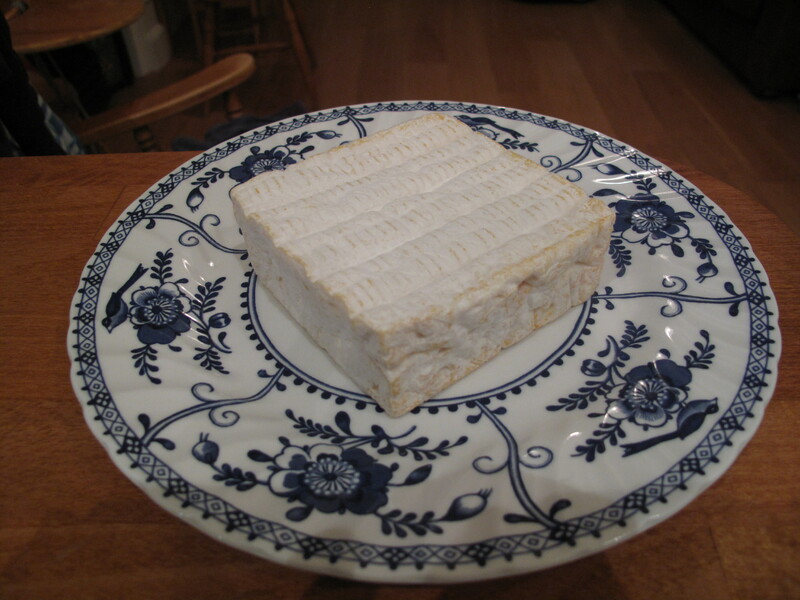 Oh I do love a handsome slice of Pont L’Évêque! And I do so love the idea of Fromage Fridays, so can’t wait to see what other cheeses you try out…bet there’s not too many I don’t like being a bit of a cheesy fiend!. Imagine baking a tart with this cheese and large tart apples…. Yes, that does sound rather wonderful!